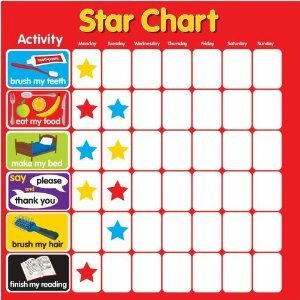 I think that every parent and child out there can benefit from using a reward chart. Some children might have a few behavioural issues that their parents would like to iron out while other children might just benefit from the lessons that they learn from having goals and achieving them. As you might well know I’m a mother of two boys Isaac who is five and Malachi who is three. My boys are definitely good children but they are by no means perfect – but then what child is? They definitely aren’t bad kids though. I did notice a change in Isaac after he started school last year. He just picked up a couple of bad habits and he was acting a bit more boisterous than normal (not that he needed much encouraging), so being the little brother Mali happily followed suit. Now because there weren’t any major issues and everyone I spoke to said that it’s just what happens when they start school, I didn’t feel an urgent need to tackle it head on. Obviously we disciplined them and tried to undo the bad habits but nothing too strong. Then it was time for the summer holidays and with Isaac being off school we saw a big difference in his overall behaviour and it was a wonderful holiday. But then it was quickly time to go back to school in September and his behaviour quickly started to slip again. It was then that we decided it was time to go a step further. Like I said earlier, they aren’t bad children at all they really are lovely but I just don’t want school to change them in a way that I’m not happy with. So when I was out shopping one day I picked up a couple of fun robot reward charts in the clearance at Paperchase*. If you like the look of the one in the image at the top of this post then you can find it here*. When I brought them home the boys were really excited to start earning their stickers. My charts run for seven days so if there is anything that I think we need to work on then it can be added to the chart the following week. Get ready nicely in the morning – I use this one to help us have a calm start to the day. Since they have been working towards this sticker there has been no squabbling at the breakfast table, they eat their breakfast quickly and head straight upstairs to get washed and dressed. An extra bonus for them is that the quicker they get ready the more time they have to play before we set off. Eat up all of my dinner – like most children, not every meal I cook is their favourite, so this encourages them to not be picky but to view each meal positively by getting a sticker once it’s all gone. Tidy up my bedroom – I love it that my boys spend a lot of time playing together with their toys, but this inevitably means that there’s a big mess at the end of each day. So to help them learn that it is fun to play but that it’s also good to tidy up once they have finished, this sticker means that they are doing this on a daily basis. It literally takes them 10 minutes (if that) and then they can have the satisfaction of knowing that they are looking after their bedroom and their toys well. Be kind – this sticker doesn’t get handed out after one or two acts of random kindness (even though they try this every day). This is the last one of the day because they need to have been kind throughout the whole day to get this sticker. We like using the word ‘kind’ because it covers a wide range of things from sharing toys, helping people and also to doing as they are asked. We have seen a really positive change in the area’s that we have focused on and we will definitely be keeping this up because it is great fun for all the family. They really love seeing their reward charts fill up with stickers and I love taking them to the shops for their well-deserved treats. How about you, do you use reward charts and do they work for you?